With the recent legislative push to raise the brewpub production limit in Nevada, it’s a good time to take a look at a brewery who moved into Reno looking to escape another state’s brewpub production ceiling. Though it doesn’t look like a huge brewery, BJ’s Restaurant & Brewhouse at The Summit Mall in South Reno is one of the most productive brewpubs in the state. The production brewery crafts about 12,000 barrels (372,000 gallons) of beer per year. That beer isn’t all consumed in Reno, unfortunately. The Summit brewpub is the cornerstone of the BJ’s Brewhouse empire and is the largest brewery (at the moment) in the BJ’s chain. The production brewery supplies ales and lagers to much of the West Coast and ships beer as far out as Indiana and Kentucky. But the bear’s share of that beer ships to thirsty California. Since California birthed the BJ’s Restaurants & Brewhouse chain, some may wonder why they built the brewery in Reno. According to Alex Puchner, Senior Vice President of Brewing at BJ’s (or “Head Beer Guy” as he puts it), the math was simple. A single California brewpub with a restaurant can, by law, only produce 5,000 barrels of beer a year. In Nevada, they can produce 15,000 barrels. But talking with Puchner, you get a sense this is BJ’s little secret. I was once under the naïve impression that there is at least some brewing going on at each of the BJ’s Restaurant & Brewhouses. But actually only three BJ’s locations in the chain brew beer, with a fourth on its way. The Reno brewery has a 50-barrel capacity, meaning the final yield for a batch is 1,550 gallons. Then there is a 15-barrel brewery in Chandler, Ariz. and a small 3.5-barrel research and development brewery in Boulder, Colo. A Texas-sized, 60-barrel brewery is on the way in the Lone Star State but that one will only serve Texas. Puchner admits BJ’s is more of a restaurant chain than a brewpub and made some good points for concentrating fermentation into one production brewery. First off, purchasing brewing equipment for the 179 BJ’s across the country is wildly expensive. He said production would also turn into a quality control nightmare. “Beer is only as good as your brewer,” Puchner said. And with 100+ brewers, you’d get a lot of different versions of their Piranha Pale Ale. Marshall Redmond heads the brewing at The Summit BJ’s. Redmond said it is a challenge to produce such large quantities of beer while keeping that craft quality. 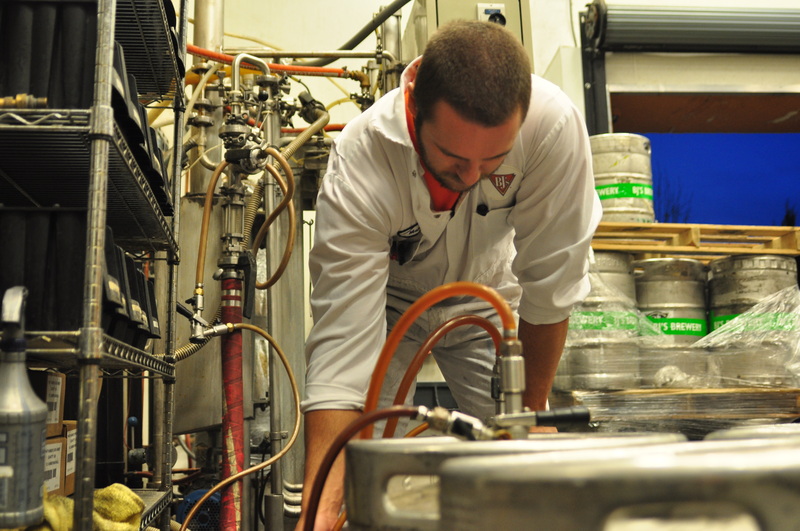 But his team of experienced brewers knows how to churn out a consistent product. Brewing 12,000 barrels a year has sure given them a lot of chances to practice in the tight brewery space. Puchner said if BJ’s could build it all again, they would probably show off their brewing facility to customers a lot more. Especially with Reno’s recent craft beer boom. Maybe if Nevada brewers are someday successful in raising or eliminating their brewpub production ceiling, we could convince them to build an even bigger brewhouse to put Texas to shame.